Did you ever wonder how to encourage a tween to read? Wrestling, football, friends… when these are the top things on your kid’s list of favorites, it is harder to get them to read. So what do you do? So, I wanted to do the same thing in our house… encourage reading. I am a teacher and a play therapist, so encouraging kids to read has always been a top priority. I want them to LOVE reading, not just be fluent or have the ability to decode words well. I want them to develop a life-long love of reading. So we started getting ready! While we were there, we found a few “secrets” that we hadn’t seen in the past and we knew I had to share them here. 1- Did you know you can go to Knockturn Alley? You’ll be able to take a look around Borgin & Burkes and see Death Eater materials & the vanishing cabinet. It feels a little scary, like it did when Harry went there by mistake. 2- They have props from the movie. They have the real desks used from the school at the park. It is the same desks that Harry and his friends used in the Defense Against the Dark Arts class. 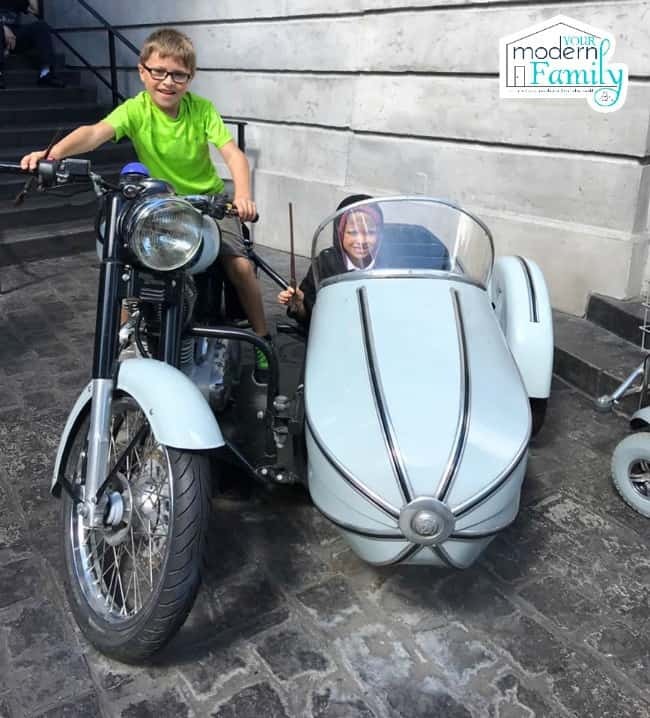 Hagrid’s motorcycle is one of the real ones from the movie, too. 4- Go to Gladrags Wizard Wear & look in the mirror – it will either compliment you or put you down. Allie stood there for about 5 minutes listening to her compliments. 🙂 hahaha!! 5- If you aren’t feeling well after riding “Harry Potter and the Forbidden Journey” there is a secret room for people feeling sick. If you actually get sick on the ride, they will give you a free pair of gym clothes from the Hogwarts’ staff. 6- There is a secret door in the wand shop and a wizard helps you find your wand… or the wand picks you. 7- If your wand stops working (if it has a scratch on the lens), they will fix it at the Owl Post for free. 8- Talk to the shrunken head! 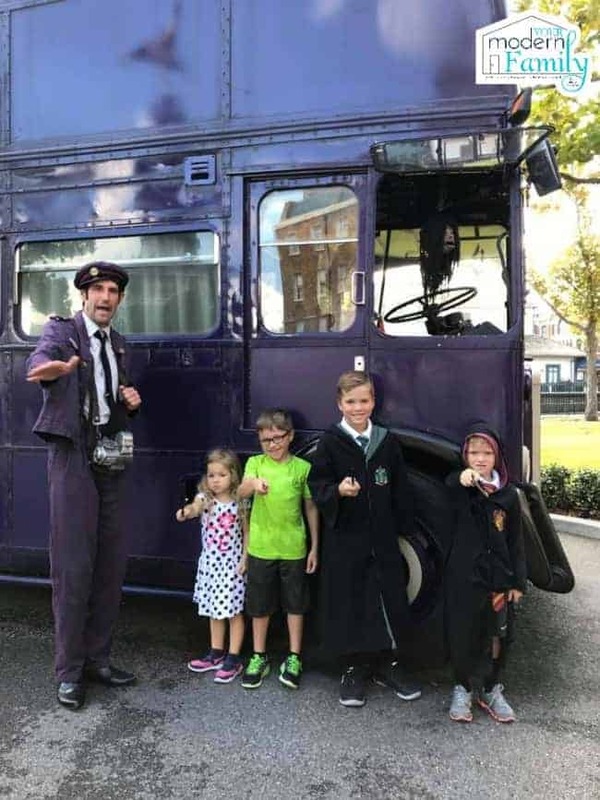 You’ll find it parked on the London embankment is the purple, triple-decker Knight Bus™, which stranded witches and wizards flag down for emergency transport. 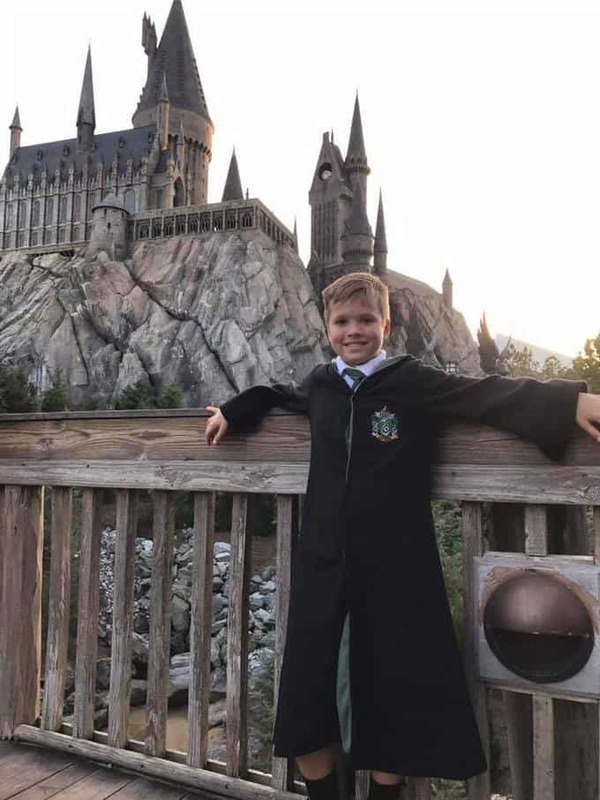 We just love Harry Potter World! The kids love it and so do we. We can’t wait to go back again next year! Thank you to Universal Studios for inviting us! We had the most amazing time!